The day started as you’d expect of an mid autumn northwest day. The air was heavy, and a light mist was falling as I headed out I-90 towards Snoqualmie Pass. Fog hovered just above the roadway as I made my way past North Bend, and began climbing in elevation. Eventually the fog would be below me, and a beautiful colors of sunrise would be in view as I hit the summit of Snoqualmie Pass, and took my exit. The view would be short lived, as I took a left, and headed back into the valley where today’s hike would start. 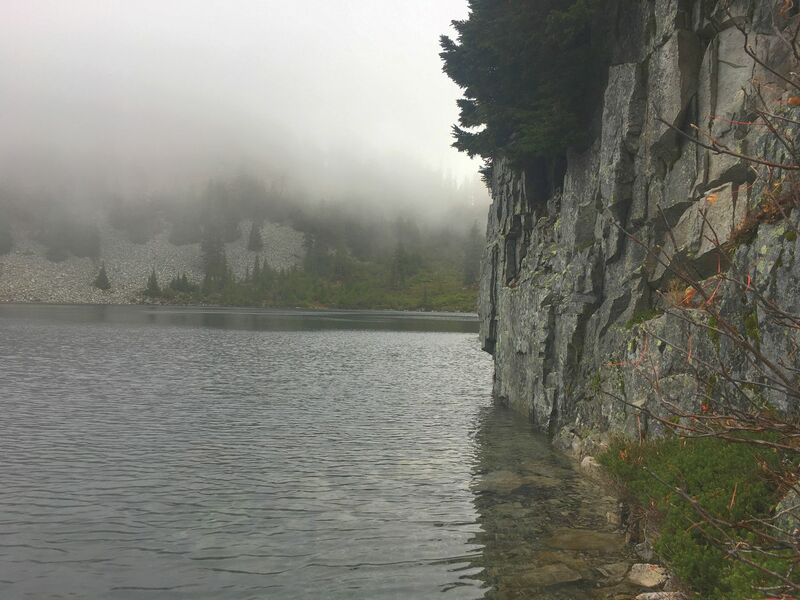 Snow Lake is one of those hikes that is close and perfect to do when you only have half a day to hike. It always has a view that doesn’t disappoint, no matter the time of year, and you can extend it if you want by linking up the other lakes in the area, or continuing off into the wilderness. It is also a hike I typically avoid during summer. Today, I’m one of 5 vehicles already parked in the lot, but if it was July, I would have been lucky to find a spot available to park, even though the lot can hold hundreds of vehicles for the Ski Resort here. So Snow Lake is also a very popular hike around here. But once school starts, and the weather begins to turn, the lot empties, and this becomes the time you’ll see me wander on up. If you haven’t done this hike before. Do it. If you have done it, but only in the summer, pick a different season. Mid spring when the snow is still around but a safe path is visible, or like this, or fall when the colors come out. I have done this hike many times, and I am always amazed on the time of year, how it changes the entire feel. From hot sunny summer days, to cold snowing winter days when the only tracks are mine and whomever has come along. The start of the hike, like many in this area, starts with a climb, eventually topping out at around 1200 feet of climbing by the time you hit the top of the ridge. Along the way you will cross talus fields, small streams, and the Source Lake Cutoff (which technically doesn’t take you down to Source Lake, but just above it on its way back up to Snow Lake). The ridge above Snow Lake will give you the highest view. Just at the top, as the trail turns slightly to the right, follow off to the left on top of a group of rocks. Here you will get to view much of the entirety of Snow Lake. Continuing on the main trail down, you’ll wind your way to the shore, passing the cutoff that continues on around the lake to Gem Lake, as well as the foundation to a cabin long gone. A view of a tarn on the way up to source lakeContinuing on the trail towards Gem Lake you’ll cross over some creeks, along with some wetland sections before eventually climbing again. You’ll eventually come to a large talus field, which can seem a bit difficult to navigate when first looking at it, but you’ll see a well worn path that makes it’s way up and through it. 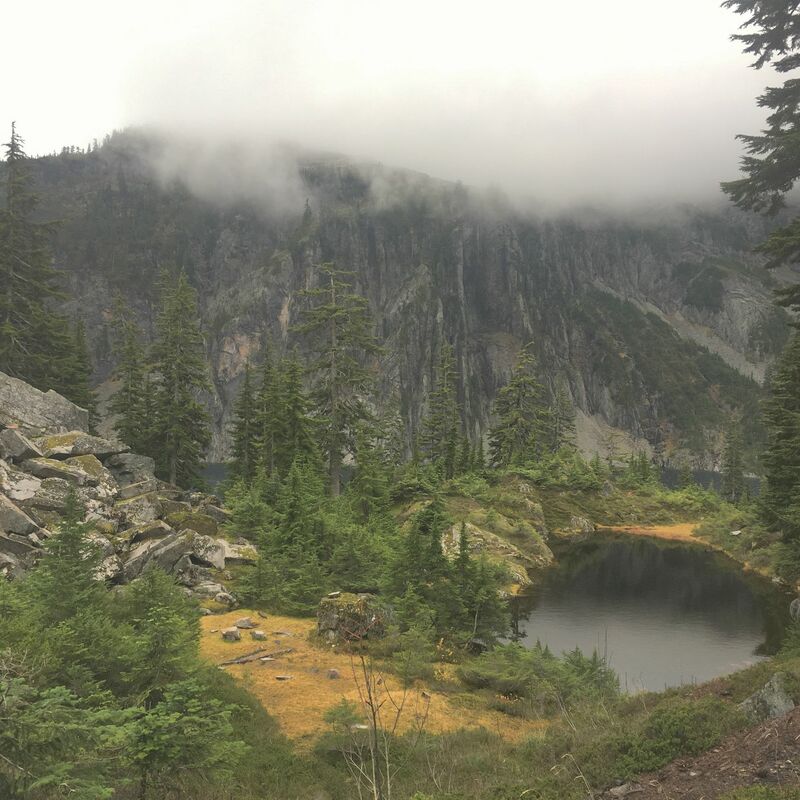 As you continue to gain around 800 feet of elevation from Snow Lake, you’ll then pop up over the ridge and look into Gem Lake. A much smaller lake then Gem, but a pristine view well worth the hike in. 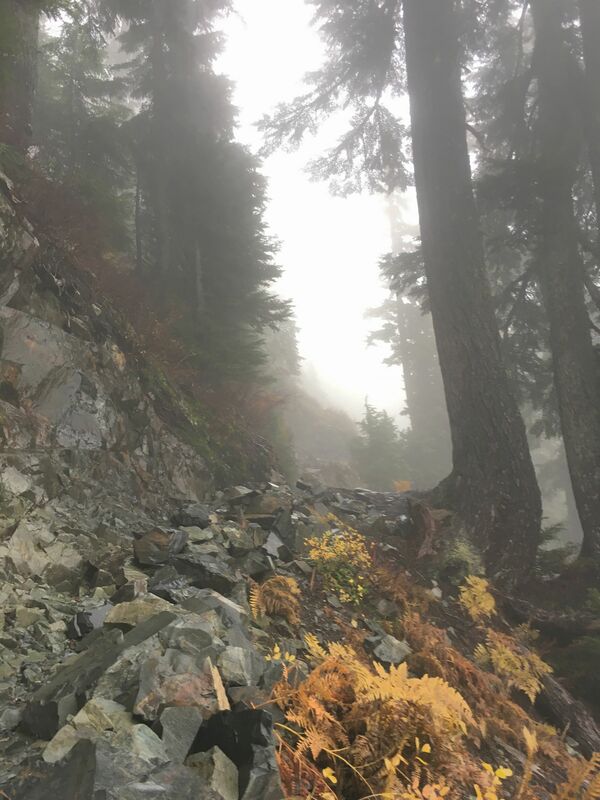 If you’re still feeling like pushing on, and you still have the time, you can continue around Gem Lake on the trail and that will eventually put you to Lower Wildcat and Upper Wildcat. Today that was not my destination, as the clouds were starting to move in, and I was expected to be back by 3. I had a little time though, so I plopped myself on a rock, fished out my JetBoil MiniMo, and made some hot coffee and mac and cheese to refuel before my return hike. On my way back, I had decided that I’d hike up to above Source Lake if both conditions I made were met. First, if I made it to the cutoff before 1pm, and the second condition was, that it hadn’t “yet” started raining. I knew the rain was going to hit soon, and I had a new rain shell that I was actually looking forward to trying out. 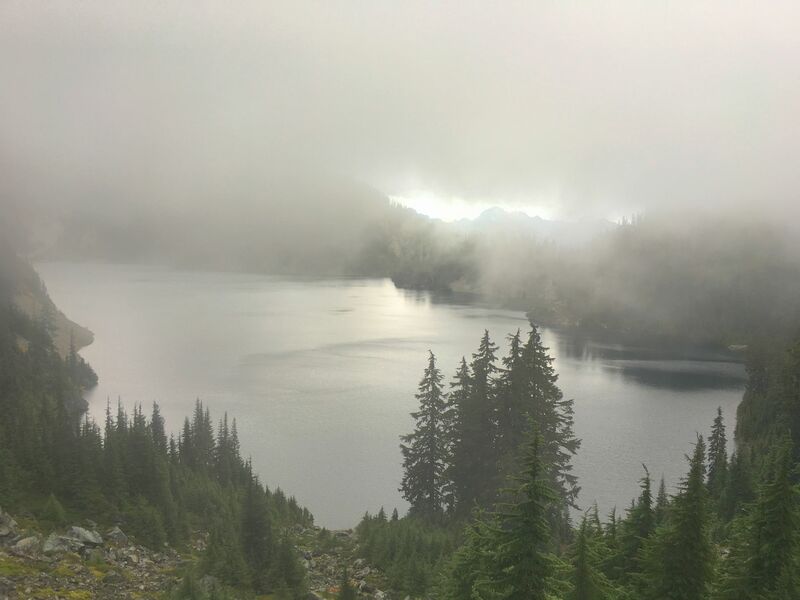 I did make my cutoff time with 3 minutes to spare, and it hadn’t started raining yet, so I headed up the Source Lake trail to take a peak at it. The funny thing is, with 3 minutes to spare until 1, and about 1 minute into the trail, it did start to rain. Out came the jacket, and it did it’s job while I pushed on over and up a little to above Source Lake. With a little time to kill, I decided to wander up the trail a little further, until eventually turning around and heading back down to my truck. The return trip was wet, as expected, but the day was well spent.